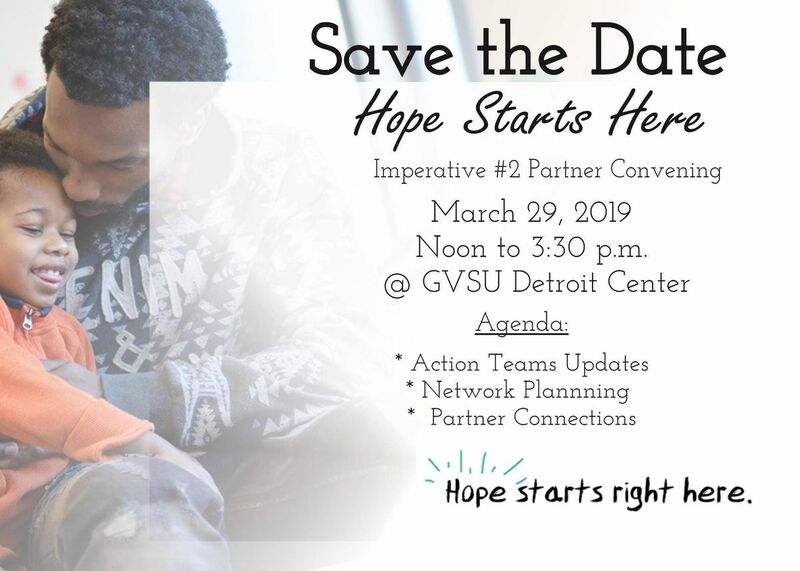 Join Us on Friday, March 29th for the fourth Imperative #2 Partner Convening from Noon to 3:30 pm to connect with fellow partners, learn about network updates and plan together for Detroit's Day of the Young Child. Registration will begin at noon with lunch and networking. The meeting will begin promptly at 12:30 pm at the GVSU Detroit Center (163 Madison Street). Do you need child care? Translation and/or sign language support or have dietary restrictions? Please let us know by completing our Support Services Form by noon on Wednesday, March 27 and we will make sure to have everything all set for you at the March 29th Partner Convening! 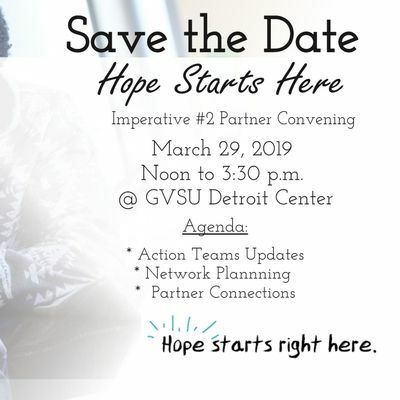 For questions regarding the event or more information on Hope Starts Here Imperative #2 work, please contact Jametta Lilly, Engagement Co-Leader, at akxpbGx5IHwgZGV0cm9pdHBhcmVudG5ldHdvcmsgISBvcmc= or via phone at (313) 832-0617. Details on the Hope Starts Here initative can be found at www.HopeStartsHereDetroit.org.